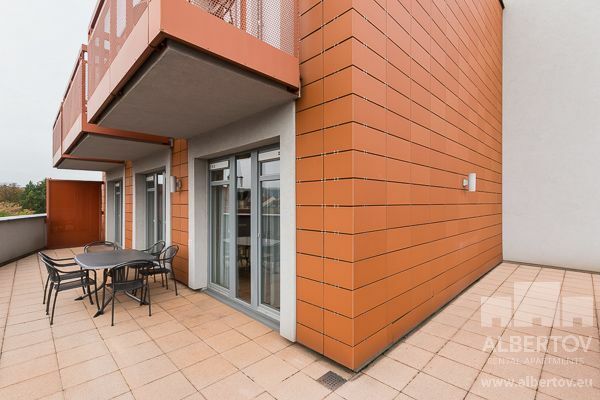 Completely furnished apartment – two bedroom apartment with a balcony for rent in Prague. Convenience, comfort, and privacy, this is the living in the closed residential complex of Albertov Rental Apartments. To make your stay comfortable, the interior of the apartment is furnished with designer furniture, high-quality wooden floors with underfloor heating, a comfortable sofa set that you can use for guests. The large windows give the apartment lightness and aerate it. Entrance from all rooms to the spacious balcony with a picturesque view of Vysehrad is an advantage. Satellite TV with many Czech and foreign channels, fast Wi-Fi internet access is surely included. The fully equipped kitchen is partly separated from the living area by a practical bar counter. The kitchen is equipped with modern appliances: glass-ceramic hob, hood, electric oven, microwave, dishwasher, refrigerator and freezer. The bedrooms are furnished with beds that have high-quality anatomical mattresses suitable for allergy sufferers, practical night tables, and spacious wardrobes. Darkening black out curtains is another advantage. Bathroom is designed with a bathtub and a shower, toilet with a bidet, sink with LED lighting, and a washing machine. 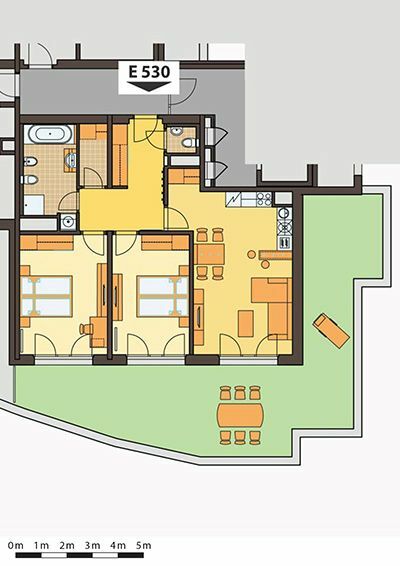 Pleasant floor heating is located in the bathroom, also in the room with a separate toilet. Plentiful storage is provided by a practical laundry room. The apartment is located on the 5th floor of the building of the closed residential complex Albertov Rental Apartments, in a quiet area below Vysehrad, near the center.